We received many of these items in gift bags and for review purposes. As always, all opinions are honest and my own. This post contains affiliate links. When your child lists artist on the top of their career goals you best believe one of the Easter Baskets you create will be a creative kids version. I will share that I am completely uncreative. Or at least that’s how I felt before I had JustaBXgirl. Since having her though, I have learned to grow creative over time. She somehow sparks something that I didn’t even know I had. She sees art and magic in everything which in turn helps me to see the magic in what I used to consider scraps! Growing up I had a very narrow image of what art is. Today, I have learned that art is so much more. 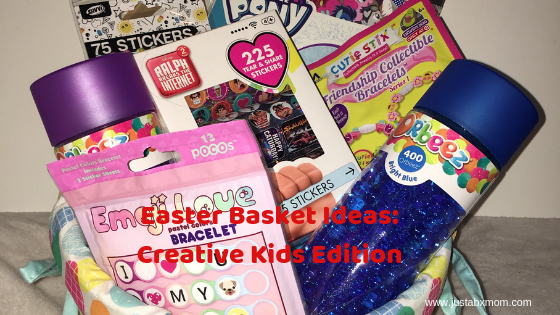 To embrace the idea of art being so many different things, I decided that the Creative Kids Edition of Easter Basket should be filled with a variety of options to create with. I love that many of these projects aren’t traditional art but can lead to some beautiful creations. Orbeez – Did you know that Orbeez have been around for 10 years??? They are one of those non-traditional creative tools that I was talking about. Until JustaBXgirl started watching YouTube I had no idea that you could create things using Orbeez. She used to spend hours watching people create cakes and centerpieces with Orbeez that I began looking at them in a whole new light. Pocos – I learned about these a while ago but hadn’t had the chance to check them out until this year’s Toy Fair. My little loves to wear personalized items. These are right up her alley. They allow littles to create bracelets, keychains and more. I know she will truly enjoy it. This is one of those things that littles will love because they can let out their creativity and have fun. Parents will love it because they will be using motor skills and can be challenged to spell words while building their masterpieces. Cutie Stix – These are another opportunity for littles to create a wearable art project. The new EZ peel sticks make it even more fun and easier than before. These are perfect to share with friends in Easter baskets, birthday loot bags and so much more. They also make a perfect activity for spring break play dates! Savvi Stickers – You can never go wrong with stickers. They are like the cherry on top of every creation ever made. They make children and adults everywhere smile. Savvi is one of those brands that we owe countless smiles to and probably never realized it. They do so many wonderful creative pieces that we have been using them for years and I just recently realized it!